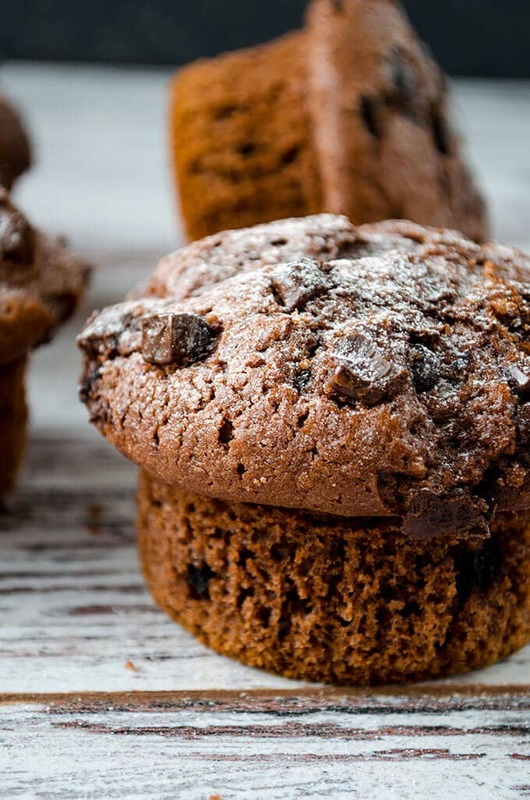 Chocolate Yogurt Muffins will satisfy your chocolate muffin craving and warm your heart on a chilly fall day. If you are a quick breakfast person, these muffins will definitely be a perfect morning treat for you. These make wonderful dessert too! I can proudly say that these are great at any time of the day. Some readers might realize that I’ve been trying recipes with yogurt and have been amazed by all the results so far. It definitely makes things moister and lighter, which is something everyone wants. So I guess I’ll be using it even more in my baking. Chocolate Fudge Yogurt Cookies and Pumpkin Yogurt Cake are still hit in our home and among our guests, but I wanted to try something different this time. That’s the reason why I wanted to make these Chocolate Yogurt Muffins. These muffins are for chocolate lovers as I used both cocoa powder and chocolate chips in them. If you are planning to have these at breakfast, spread a little nutella or peanut butter on their top and enjoy more. The chocolate chips inside and on the top make them even more chocolaty and rich. 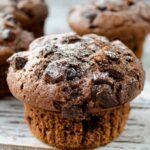 The outside of these Chocolate Yogurt Muffins is slightly chewy but the inside is soft and fluffy thanks to yogurt. I used plain Homemade Yogurt in them, so it was a little watery. If you use store bought yogurt, you might need to change the measurement and add some mik because it is thicker. I guess ½ cup yogurt and ½ cup milk will be ok.
Light chocolate muffins made with yogurt. Preheat oven to 350F (175F). Line a muffin pan with liners. I used Jumbo pan and 6 liners. In a bowl whisk together the flour, cocoa powder, sugar, baking powder and salt. In a separate bowl, whisk egg, yogurt and oil until combined. Gradually pour the flour mixture into egg mixture and stir with a spatula. Don’t overmix, just until everything is blended. Fill the liners 3/3 way full with the batter and top with a few additional chocolate chips. Bake for 20-25 minutes for Jumbo muffins. Reduce the time for smaller muffins and check with a toothpick test. Let them cool for about 15 minutes before removing. Cool on a wire rack completely. Sift a little powdered sugar when serving if desired. I used plain homemade yogurt in them, so it wasn’t very thick. If you use store bought yogurt, you might need to change the measurement because it is much thicker. I guess you should add 1/2 cup yogurt to the ingredients above if the yogurt you use is very thick and you have a dry mixture at the end. I veganized this recipe by using coconut yogurt, no egg, and I added 3/4 cup of almond milk. Really good! I pop one in the microwave for 7 seconds, just to melt the chocolate chips. Thanks for sharing! Hi Kim! Glad you and your girls loved them! Really disappointed that I still wasted ingredients on this after I read it and thought there wasn’t enough liquid for thi amount of flour. You really should be testing these recipes that you post exactly how readers are going to interpret them. Thanks for asking Ivana! I’ve just corrected the recipe. Thank you Ingrid for sharing your experience and the changes you made in the recipe. It could be the type of yogurt we use. Mine was plain and juicy because it was homemade. Adding almond milk and applesauce is a great idea to give some more wetness to the batter. Great to hear that you ended up with a result that the kids loved! Could it be you meant to say 2 cups of yogourt? The mixture was very dry so I had to add another cup. Hoping they turn out. These are slightly tangy from the yogurt and not overly sweet like many chocolate muffins tend to be. I used a mini muffin pan and baked them for 12 minutes. I like that there is only 1 tsp of sugar in each mini muffin. Thanks for the great recipe! Something wrong here. Mixture is way too dry. Oh! It must be cocoa powder not flour. Correcting it right away! Thanks for asking it here.